The details of the figures show how they were used and decorated over the years. The facial features are smoothed down due to wear and handling. Ere Ibeji represent an individual in an idealized or prime state, so although twins most often die in infancy, ibeji are carved as full grown adults. The accumulation you see on the surface would have been due to the mother's attentions to care for and feed her babies, or ritualized offerings from later generations. 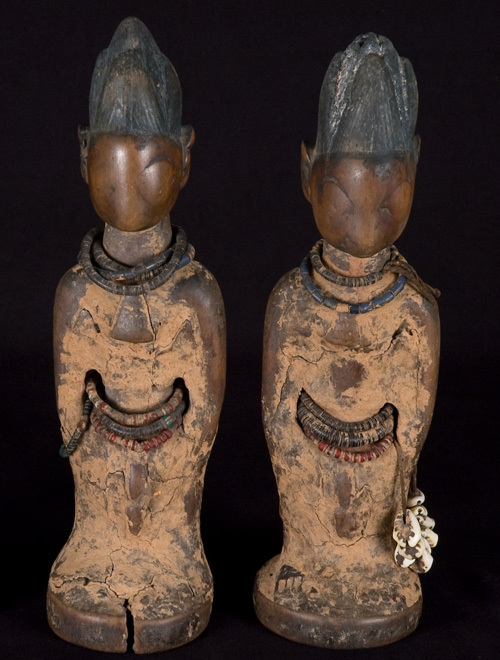 Ibeji figures are often adorned with beaded necklaces, bracelets, and belts. Cowrie shells are a traditional form of money in many West African cultures.